Heat oil in a pan add cinnamon, cardamom. cloves one by one. Then add chopped onions, chopped green chillies and fry well. Now add chopped tomatoes and ginger- garlic paste and stir well. Put red chilly powder, coriander powder,garam masala powder and salt mix well. Now add curd and mix . Close the lid and let it cook. delicious...channa biryani super ah eruku..
the chana biriyani looks absolutely inviting. 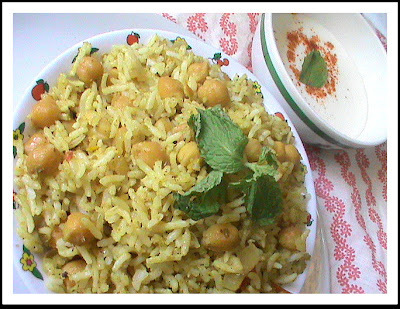 chana biryani looks delicious... yummy..
Any pulao is my favourite ..just right for lunch.I haven't made with chana as yet.will make it soon.